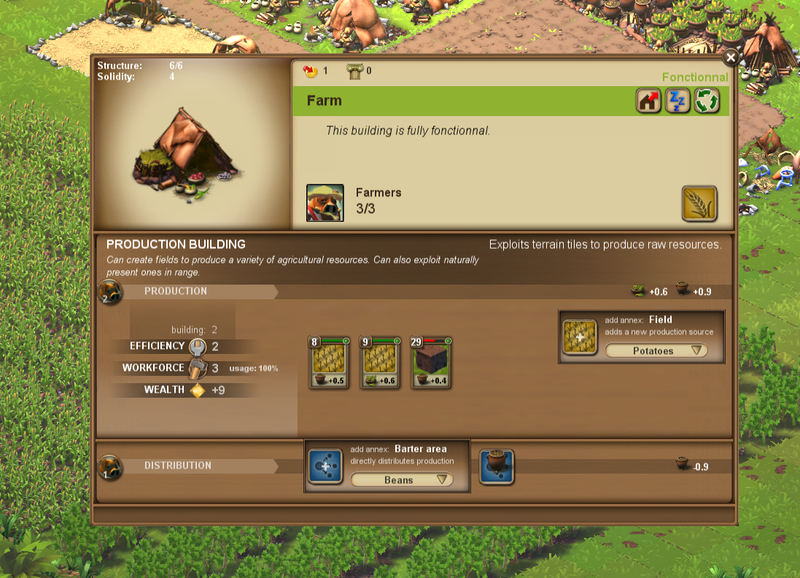 Here is a screenshot of the new building UI, in this case for a production building. I’m going to explain a bit what it tells us about this particular building. The top part gives us general informations about the building while the bottom is specific to its role ( production ). The building is a farm, and it currently costs 1 coin of maintenance. It has points of structure ( the building’s hp ) and solidity ( the building’s “armor” ). On top right we have the currently available general functions : abandon the building, put it to sleep or tear it down. We see the building is currently functional, and employs 3 porcos as farmers. On the bottom right of these general infos, we see there is one upgrade available to another farm building (details about the upgrade would pop up when putting the mouse over that button). Then there’s the role specific UI on the bottom. Here its the UI of a production type building. Its divided in 2 parts : production of resources and distribution of these resources. It also shows the available annexes for this building. Annexes are sub-buildings that belong to a main building. In the case of this farm, we see it can build “field” annexes giving additional resource production, and you can choose what type of crops you want these fields to grow. It can also build a distribution annex , the “barter area”, allowing to distribute produced goods directly to the population. We see 2 of the farmers are busy producing while the 3rd one is busy distributing, selling some of the production directly to the population using one built distribution annex. The building is producing 0.9 of beans and 0.6 of corn, and all the beans are distributed by that 3rd porco . The remaining production (here the corn ) will go into granaries or be sold by merchants. Production is always expressed “per cycle”. A cycle can last a variable amount of real time depending on the game settings. If you’re playing in a persistent 24/7 game its likely to be 2hours while in a ‘realtime’ game it would be something more like a minut. The building has an efficiency of 2. That depends of the building itself but eventually will also depend of techs, connection to roads and placement. This, combined with the actual number of porcos producing, defines the actual workforce of the building ( 3 ). This workforce is used to work all the production sources available : 8 fields of beans, 9 fields of corn, and 29 wild beans in range of the farm. The 2 farmers are 100% busy working these and while the fields are properly exploited, we can see they don’t have enough workforce to also fully exploit the wild beans. To do that we’d need more workforce, so if we wanted we could upgrade the farm to increase its efficiency or put back the 3rd porco in production (but the farmers would lose the income of direct distribution which is higher than selling to merchants ). This farm is adding 9 to the total region wealth. Wealth produced by buildings is directly proportional to the amount of busy workforce of the building. Total region wealth is then splitted between all the inhabitants of the regions depending on their respective incomes. A porco’s wealth defines its purchasing power and therefore the price of goods in the region (as merchants will continuously adapt to the available market), so its pretty important to increase it. Think of Wealth as some sort of objective unit of GDP. 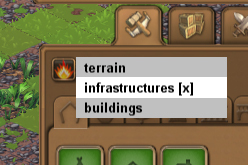 It is now possible to filter what you want to destroy when using the destruction tool : terrain ( will clear trees and other natural things ), infrastructures ( will clear things like roads, walls built by player ) and buildings ( will trigger destruction of all buildings in the selected area ) by right-clicking on the tool. You can enable or disable each filter individually. Also building aren’t destroyed instantly anymore. You can trigger destruction by clicking on “tear down” in the building’s menu or when using the destruction tool. The building enters a ” tearing-down” state that takes time,losing structure points progressively, and only disappears when the process is complete. When complete you recover half of its initial materials. The process can be cancelled before its complete. Why this ? 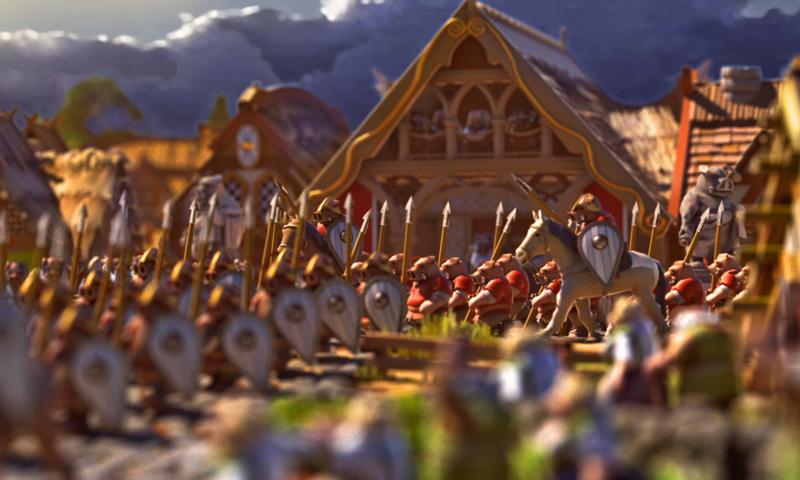 Mainly for multiplayer to avoid instant sabotage of cities where a player would erase its whole region in a second before its invaded. This doesnt mean i want to forbid players practicing this Russian strategy, but i eventually want it as a separate feature where you can set your whole city on fire. While a building properly teared down actually disapears and gives back some materials, a building violently destroyed becomes a burnt down ruin and remains on the terrain. It will still need to be teared down if you want to clear its space. Or you’ll be able to repair it at a lower cost. With this, repairing damages will be less of a hassle because coordinates and building types are preserved in these ruins, so you dont have to place again everything trying to remember how it looked. Eventually it will also be possible to trigger an auto-repair mode so damages are automatically repaired even if you’re offline. Stone tools now require a resource to be crafted : flints. And therefore there’s a new stone age building to produce flints (out of any gravely tiles). This building is free as its one of the most basic buildings of the game. 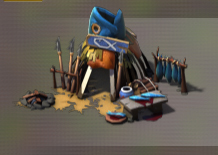 I re designed the stone age fishing building to have a more unique visual identity. The placement of infrastructures ( roads ect… ) has been refined and repaired. Its now designed to later support a broader range of infrastructures (ex irrigation canals, walls, gardens etc ). I’m now redesigning the production building’s UI to make it clearer to read, and refining all their functionalities (like annex placement).